Are you looking for a game of chance you can play to win real money from the comfort of home? Online keno is one of the most popular luck-based games available – we explain more about the rules of online keno, how you can play for real money at the best casino sites, and the keno bonuses available for Aussie players. 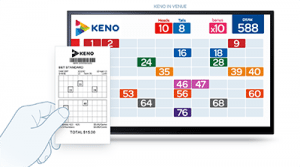 Given its widespread popularity, a majority of Australian adults are familiar with keno, as it is played at pubs, clubs, newsagencies and lottery outlets across the country. Keno is a luck-based number game that follows a similar format to lotto, providing the chance for an instant win based on nothing more than pure luck. It requires players to pick up to 20 numbers from one to 80, place a wager, and then hope those numbers are matched with the winning picks. Payouts are paid according to the amount of successful matches, with odds varying based on how many numbers you picked and how many matches you have. Online keno works in exactly the same way as real life keno, but offers a more convenient and accessible platform. When playing keno in real life you have to physically purchase a ticket and mark you picks down with a pencil, but when playing online you just click to pick your numbers then hit the start button whenever you are ready, with games available 24/7. Guts Casino – Guts is an instant-play casino that offers games from some of the best gaming studios in the business, including Microgaming, NetEnt, BetSoft, Evolution Gaming and more. Type ‘keno’ into the search engine in the game lobby and you’ll be taken to one of the most popular keno variants on the Web. Royal Vegas Casino – Royal Vegas is powered by leading software guru Microgaming, and offers two of the studios most popular keno games – Microgaming Keno and Monkey Keno. 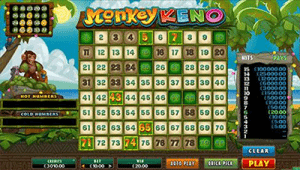 Monkey Keno adds a fun twist on gameplay, where the keno board is set against an ocean backdrop and numbers are chosen by monkeys pummelling coconuts at the board. Games at RVC are available for instant-play or via downloadable software. Thrills Casino – Thrills is a vibrant online casino that offers a range of real money games for online players, including Microgaming’s classic Keno title. Games are available download-free, with the most popular games also flawlessly optimised for mobile play for smartphones and tablets. Note: As of 2017, Thrills no longer accepts players from Australia. Along with keno, these trusted sites also offer hundreds of other casino games, including pokies, blackjack, roulette, video poker, scratchies, bingo, live dealer games and a range of table games. Our recommended casinos are all licensed by reputable offshore gambling jurisdictions that accept players from Australia, with real money deposits available using AU-dollars. Are there any online keno bonuses available? Guts Casino – Claim up to $500 in bonus money and get 100 free spins on the pokies. Royal Vegas Casino – Claim up to $1200 in matched deposit bonuses over your first three real money deposits. The bonuses don’t stop there. Each of these keno sites offer a loyalty reward program for registered players, so you’ll start racking up points every time you play, which can later be redeemed for casino credits and cash prizes. Sign up to receive promotional emails from these venues so you’ll be the first to know when new one-off promos, competitions and bonuses become available, with new offers sprouting up all the time. Sign up for an account with one of the our recommended keno sites, using our links so you can take advantage of the fantastic welcome bonuses on offer. Go to the banking section and make an instant deposit in AUD using a trusted payment method like Visa, MasterCard, Neteller, Skrill, Paysafecard or Flexepin. Find the keno game you wish to play by entering ‘keno’ to the game search engine, or go to the ‘other’ games category, and load the game directly over your Web browser. Use the buttons at the bottom of the game to set the size of your wager, then click on the keno board to select your chosen numbers (the payscale to the side of the screen will be adjusted accordingly so you know what you stand to win). Hit the play button and watch as the winning numbers are called, with any of your hits automatically registered by the computer and any winnings deposited straight to your casino account. If that still sounds a tad daunting to you, our top-rated online casinos also provide the option of playing for free in practice mode. This gives you a chance to demo games and get a hang of how online keno rolls out before having to risk any of your own money – just another reason why so many players are favouring online play. Sign up to play real money keno online at Guts.com and new players can claim up to $500 in matched deposit welcome bonuses, plus receive 100 free spins to use on selected pokies. Guts is one of our top-rated casino sites, providing instant-play games with deposits available in Australian dollars.